Galax, VA -- To celebrate the Fourth of July weekend, the Blue Ridge Music Center is welcoming The Jeff Little Trio and New Ballards Branch Bogtrotters to the amphitheater stage on Saturday, July 4, at 7 p.m., for a Holiday Dance Party. A special banjo exhibit will be featured daily. During the concert, The Galax Smokehouse will be on site serving its signature barbecue, down-home sides, drinks, and desserts. Hiltons, VA -- Wayne Henderson’s top-notch finger-picking is a source of great pleasure and pride to his friends, family, and neighbors in Grayson County, Virginia. His guitar playing has also been enjoyed at Carnegie Hall, in three national tours of Masters of the Steel-String Guitar, and in seven nations in Asia. In addition to his reputation as a guitarist, Henderson is a luthier of great renown. He is a recipient of a 1995 National Heritage Award presented by the National Endowment for the Arts. He produces about twenty instruments a year, mostly guitars; he is almost as well-known for the mandolins he has made. Doc Watson, a good friend who sometimes stops at Wayne's shop in Rugby, Virginia, to pick a few tunes owns a Henderson mandolin. Saturday, November 3rd, 2012, at 7:30 p.m. the Carter Family Fold in Hiltons, Virginia, will present a concert by an old time band - Wayne Henderson and Friends. Performing with Wayne will be Jeff Little, piano player extraordinaire. Admission to the concert is $8 for adults, $1 for children 6 to 11, under age 6 free. Hiltons, VA -- Wayne Henderson's top-notch finger-picking is a source of great pleasure and pride to his friends, family, and neighbors in Grayson County, Virginia. His guitar playing has also been enjoyed at Carnegie Hall, in three national tours of Masters of the Steel-String Guitar, and in seven nations in Asia. 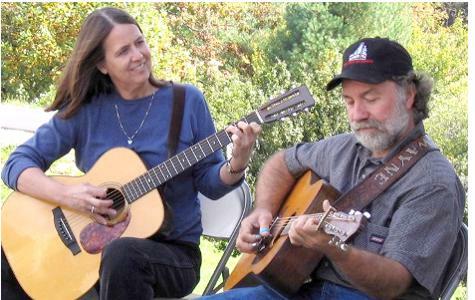 Saturday, June 2nd, 2012, at 7:30 p.m. the Carter Family Fold in Hiltons, Virginia, will present a concert by an old time band - Wayne Henderson and Friends. Performing with Wayne will be Jeff Little, piano player extraordinaire. Admission to the concert is $7 for adults, $1 for children 6 to 11, under age 6 free.